Hello everyone and happy Saturday! 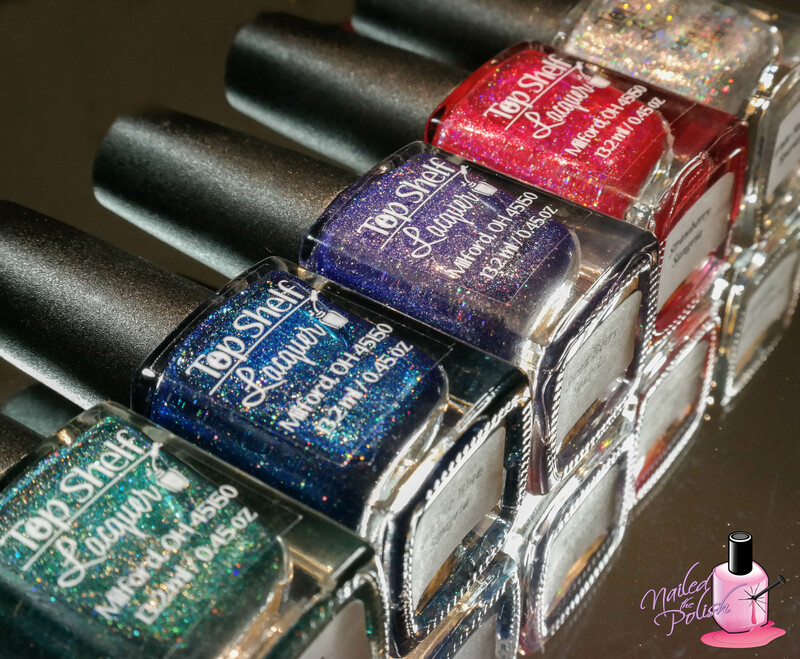 In today’s post, I will be sharing swatches and my review of Top Shelf Lacquer‘s Holo’d Sangrias Collection. This collection consists of 5 polishes – 4 vibrant jewel tones holos and 1 holo that can be worn alone or as a holo top coat! These beauties are available for purchase now – more info at the end of the post. Seafoam Sangria is a gorgeous teal jelly linear holo with scattered holo micro glitter. Shown here is two coats plus top coat. I contemplated adding a third coat since I had slight VNL (visible nail line) but decided it wasn’t very noticeable so I left it at two. The formula is wonderful and very easy to control. I am loving the added micro glitters! Sweet Berry Sangria is a deep amethyst jelly linear holo with scattered holo micro glitter. Two coats with top coat. The formula, application, dry time, all great! My pictures show this polish as a blurple – a little blue, a little purple – but in person this polish is 100% on the purple side. The holo in this polish is to die for! Strawberry Sangria is a bright ruby jelly linear holo with scattered holo micro glitter. Shown here is two coats plus top coat. Another polish with an amazing formula! Easy to apply, great coverage, and upon removal, I had no staining. I had a little trouble getting the holo to come through in my pictures but trust me, it’s there! I love how the pink holo flash compliments the ruby base color so well. Pacific Blue Sangria is a vibrant sapphire jelly linear holo with scattered holo micro glitter. Shown here is two coats plus top coat. Oh how my heart melts with this polish! Not only do I have a deep love for holo polishes, I also have a deep love for royal/navy/sapphire blue polishes, so for me this one is a must have! As with all the other polishes in this collection, the formula is divine. If the Pacific Ocean looked at all remotely like this, I would be swimming in it every day! The last polish in this collection is White Sangria Sparkler – a clear linear holo with added holo micro glitter. This polish can be worn alone (as shown in my swatch) or over any polish to give it a holo effect (as shown here by Polished Jess). I used three coats plus top coat in my swatch. Same formula as the others in the collection – wonderful! The polish on it’s own is so delicate yet packs a punch when used as a topper! I love holo. I love sangria. So of course I love Holo’d Sangrias! lol Okay, in all seriousness, I really do love this collection. Even though the polishes are in jelly bases, they reach a pretty nice opacity in just two coats. The formulas are lovely and as an added bonus, they watermarble! This watermarble was done over my White Sangria Sparkler swatch. I initially tried to use all five colors but had trouble getting all five to show up on my nail. I had the best outcome when I used a max of three holo’d sangrias. My favorite is definitely Pacific Blue Sangria. Something about that sapphire base speaks to my soul! As I stated above, this stunning collection is available for purchase now through Top Shelf Lacquer’s Etsy store here. This collection is sold in two sizes – Full (13.2mL) and Polish Shot (8mL) and as a set or individually. 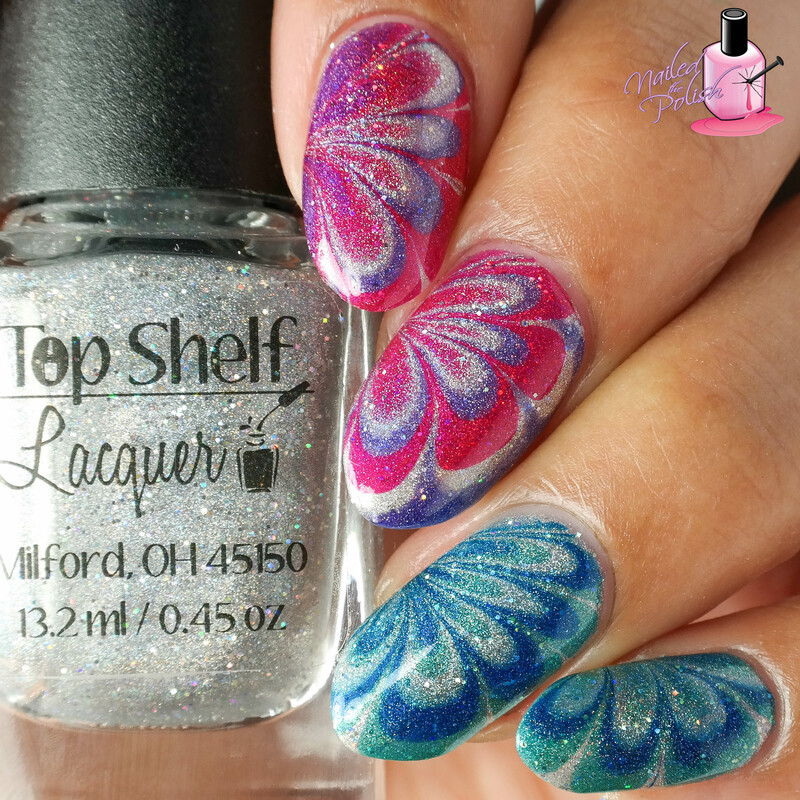 Be sure to check out Top Shelf Lacquer on Instagram and Facebook for more!